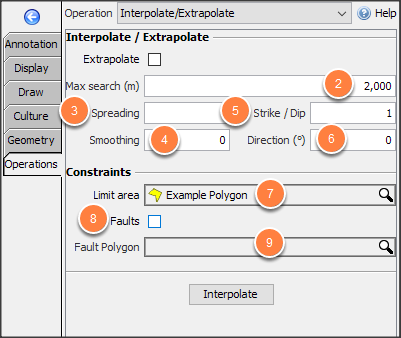 Use Insight's interpolation/extrapolation operation to fill gaps and holes in horizons. Regular X/Y, 3D and 2D horizons can be interpolated. To interpolate or extrapolate sparse X/Y horizons, use the regrid operation to convert them to a regular grid. Where is the Interpolate/Extrapolate operation? Note: The Interpolate/Extrapolate button is disabled if the input horizon is waiting for another operation (such as propagation). Insight notifies you to complete the previous operation before continuing. Interpolate/extrapolate is found in the Map View, under the Operations tab (along with other horizon operations). The default mode (interpolation) fills enclosed regions according to the settings. In the navigation bar, select the horizon to interpolate. At Maximum search (m), define the maximum distance. When finding a result at a location, points beyond this distance have no effect. Strike/dip: define the influence in the strike direction. Direction (degrees): The azimuth of the strike axis, in degrees (clockwise from North). At Limit area, select a polygon/probe to constrain the operation. To create a probe or a polygon, see Creating a Polygon in Map View or Creating a Probe. 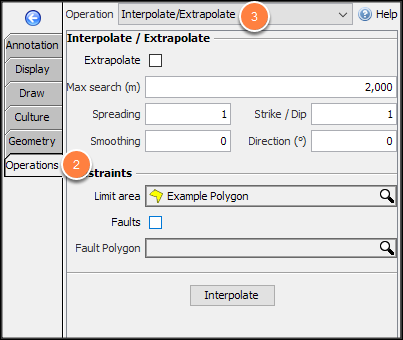 Enable Faults to prevent the interpolation from crossing fault planes. Insight honours any enabled faults in the Control Panel. Unassigned fault sticks are not used. Click Interpolate to start the operation. Enable extrapolate to completely fill a specified region according to the settings. Enable the Extrapolate check box. The maximum search distance has no effect when extrapolating. Constrain to area field changes to Fill area. Click Extrapolate to start the operation. Click Replace this horizon to save this horizon containing the extracted values and replace the previous one. 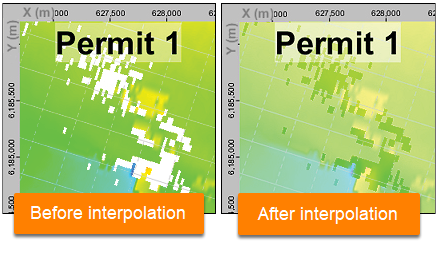 To assist reviewing the results in the 3D and Map Views, interpolated / extrapolated points are displayed in a solid colour. The original values appear semi-transparent. This lasts until the operation is completed. Note: By default, the new horizon will be named: “horizon_name (interp/extrap)”. For example, the operation above will yield a new horizon called "Sample (interp)". To rename the horizon, see Horizon Details and Configuration.